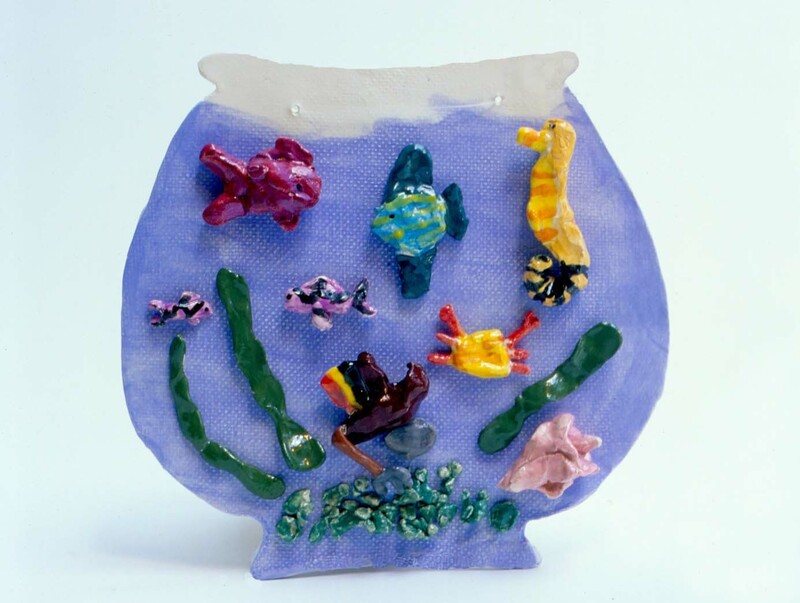 After rolling clay slabs, the children cut out the shapes of fishbowls and fill them with underwater creatures. For ages 6 to 9. Plan 4 sessions. Click here to view additional information about working with clay in a printer-friendly format. Check the clay several days ahead to be sure it has a good workable consistency. Wedge the clay into grapefruit-size balls, planning one per child, plus a few extra. Cover the work area with Masonite boards (unfinished side up) or canvas. Set out clay balls, newsprint paper, pencils, rolling pins, and needle tools. Set out examples of fishbowls. Explain that in this session the children will be rolling slabs, or thick, flat pieces of clay, and then cutting out fishbowl shapes. In the next session they will be filling the fishbowls with three-dimensional fish that stand out from the plaques. Demonstrate how to make a clay slab. Starting from the center of the ball of clay, roll away from yourself to the edge of the clay with enough pressure to begin flattening the clay. Lift the rolling pin and return to the center. Roll towards yourself using the same pressure. Rotate the slab and repeat these steps, gradually increasing the pressure until all sections of the slab are even and at least three-eighths-inch thick. Use a needle tool to write your name in the center of the slab and then flip the slab over to be sure it doesn't stick to the work surface. Share the examples of fishbowls with the children. Discuss how the contour line goes around the edge of the bowl and includes the lip, or top edge, and the foot, or bottom edge. On newsprint paper, draw the contour line of a fishbowl, making it large enough to fill the paper and hold lots of fish. Show the children how to transfer the drawing onto the clay slab by laying it on top of the slab and using a pencil to go over the lines, making a slight indentation in the clay. Then remove the drawing and with a needle tool cut along the indented line. Have the children roll slabs, draw fishbowls on newsprint paper, transfer the drawings onto the clay, and then cut out the fishbowl shapes. Note: Put two holes in the top of each fishbowl slab for hanging, and then cover the slabs carefully with plastic wrap to keep them from drying between sessions. Set out clay balls, fishbowl slabs, needle tools, and small containers of slip or water. Have available pictures of fish to share with the children. In this session, the children will be using clay to make fish and other related items to fill their fishbowls. Share the pictures of fish, pointing out their fins, tails, and eyes. Discuss other things that might be found in fishbowls, like seaweed and gravel. Demonstrate the pinch method by pinching and pulling shapes from a single piece of clay. Explain that this works well when making small objects. 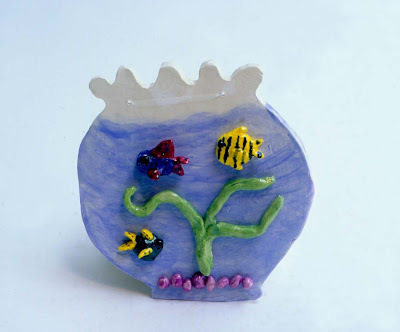 Remind the children that the fish should be three-dimensional and to use the scratch and slip process if extra pieces of clay are attached—scratch the surfaces to be joined, apply a small amount of slip or water, and press the two pieces together. Have the children make enough items to fill their fishbowls and then lay the items carefully on top of their slabs, leaving them unattached. Note: Place the unattached items on top of the slab and cover with plastic wrap. Dry the clay very slowly, gradually exposing them to air over a two week period to keep the slabs from warping. When completely dry, bisque fire the slabs with the still unattached items on top in a kiln. Fill a fishbowl with water until it is about three-quarters full. Set out fishbowl with water, bisque-fired clay pieces, brushes, and a variety of underglazes. Have available pictures of fish. Explain that the clay has been fired in the kiln. It is now referred to as bisque ware and is very fragile, so it must be handled carefully. The children will be adding color to the bisque ware using underglaze which is paint for clay. Demonstrate how quickly underglazes dry when applied to the bisque ware. The children will need to dip their brushes often to avoid scrubbing and to cover all areas. They should carefully dab into any cracks or rough areas on the clay surface, brushing away any puddles. Explain that designs can be put directly on top of dried underglazes and that the last color painted is the one that will show. This makes it easier to add designs or repair mistakes. Once again, share the pictures of the fish, pointing out the many colors and patterns. Explain to the children that they can use the designs of real fish or create their own. Since the fish will stand out from the plaques after they are attached, all sides of the individual fish should be painted. Show the children the fishbowl with water in it, so that they can see that the water level does not completely fill the bowl. Have the children paint the water level on the fishbowls and then paint the fish and individual items. Note: Although not necessary, bisque firing the clay once again makes it easier for the children to apply the clear glaze in the next session. Set out clear glaze and brushes. Set out the underglazed clay pieces. In this session, the children will be applying a clear glaze to their clay pieces which will give the clay a shiny and strong surface. Explain that the clear glaze will cover up the colors of underglazes temporarily. When the clay is fired in the kiln again, the glaze will melt and turn clear, allowing the colors to show through. 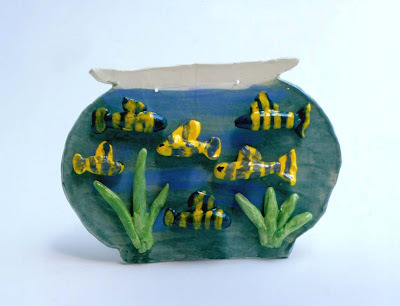 Make sure the children understand that if any glaze gets on the bottom of the fishbowl slabs, they will stick to the kiln shelf during firing. If glaze does get on the bottom, wipe it off with a damp cloth. They should also avoid getting glaze in the holes in the slabs that will be used for hanging the fishbowls. After applying glaze to the fishbowls and the individual pieces, have the children put an extra dab of glaze on the bottom of each piece and position it on the slab. Explain that after the clay is fired again in the kiln, the glaze will hold the pieces in place. Note: Push a needle tool through the holes for hanging to be sure they are clear. Let the glaze dry overnight and then glaze fire the clay in a kiln. To hang the plaques, put fishing line through the two holes and tie a knot. A small dab of white glue will prevent the knots from untying. Water works as well as slip for joining pieces of clay and is less messy. It’s essential to emphasize and monitor the safe use of needle tools. Using the clear glaze to lock the pieces in place instead of scratch and slipping them to the slab makes it much easier for the children to paint these projects. Although string or wire can be used to hang the plaques, the clear fishing line disappears from view and won't obstruct any parts of the design. Discuss how the pinch and slab methods of building were used in the fishbowls. Are the fish and other items three-dimensional? Ask the children to point out additions that add interest to the plaques, such as adding gravel or changing the direction in which the fish swim. The clay keeps sticking to my rolling pin. I want to put a seahorse and a crab in my fishbowl. Can all of my fish be the same? I’m afraid I will get glaze on the bottom of my slab and it will stick to the kiln shelf. Start rolling your slab at the center of the clay ball. Lift the rolling pin and return to the center each time. If you roll back and forth, the clay will stick to your rolling pin. You can decide what to put in your fishbowl as long as it is something that lives underwater. All of your fish can be the same or different—you can even design your own imaginary fish. Don’t lift your fishbowl from the table while applying the clear glaze. This will help to keep glaze from getting on the bottom of the slab. Click here to view this lesson in a printer-friendly format.